This year’s Game of Thrones Comic-Con panel was pretty unique. In past years, the season is usually over by July so the panel mainly looks back. This year, though, with the current season just starting, there wasn’t much the panel could talk about or show. So it became a pretty free-flowing, all-over-the-place conversation—with a noteworhy moments. 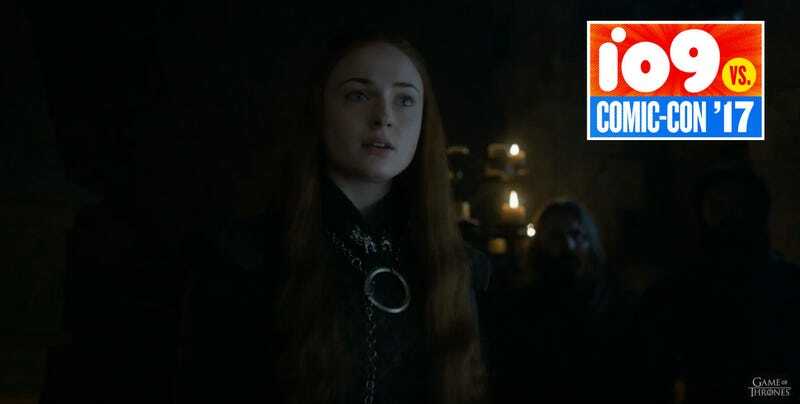 • Sophie Turner was asked if she thinks Sansa is being manipulated by Littlefinger. She said that maybe at one point she was but, by now, she’s been around so many devious people, she’s just as good as at manipulating people as he is. • “She’s woke now, guys. She’s real woke,” was Turner’s joking response while talking about Sansa’s current world views. Turner thinks her character is done with any real romantic love because of all she’s been through and is probably incapable of trusting anyone. “Which is important when you play the Game of Thrones,” she added. • John Bradley explained that Sam is at the Citadel solely for the purpose of aiding his friend Jon Snow. Bradley thinks Sam wishes he could stand shoulder to shoulder with Snow in war, but knows he can’t. So, instead, he went to the Citadel to find any kind of information that would help Jon win his war. “The Citadel is his battlefield,” Bradley said. • Much was made of the crush Tormund has for Brienne and Christie said she doesn’t think Brienne likes it too much. She finds it awkward but, doesn’t deny there’s some “potential secret enjoyment” in it. She may end up liking him or, according to Christie, she may still like someone else. • The whole cast was asked which dead character they’d like to bring back and the best answers were from Sophie Turner and John Bradley. Turner said Joffrey because she loved working with actor Jack Gleeson—Joffrey—so much, an answer which got showered with boos. And Bradley said he wished they never killed Jon Snow because then they wouldn’t have had to talk about it every five seconds for a whole year. • Finally, Turner was asked about her relationship with Jon. She couldn’t say much as it will obviously be a big part of the current season. What she would say was her character is definitely frustrated by the sexism of the culture and hopes Jon realizes how much better she is at the political side of ruling than he is. He’s the military man, she’s the politician, and Turner hopes they can each use their best traits. The panel then ended by showing this awesome sneak peek at the rest of season seven.